I cleave the heavens, and soar to the infinite. Born in Nola, near Naples, during the turbulence of the Reformation, Bruno led a remarkable career, beginning as a Dominican before leaving the order suspect of heterodoxy. He proceeded to wander across Europe, teaching Hermeticism and his own unique system of memory-training, and associating with many of the leading intellectual and political figures of the day. He met the luminaries of Calvins Geneva, and of the court of Queen Elizabeth of England, such as Sir Francis Walsingham and fellow-mystic Dr. John Dee, the French court of King Henri III, and the universities of Germany. Yet, he was embroiled in bitter controversies throughout his whole life as his theories and irascible personality made enemies of his royal patrons and academic hosts. He managed to annoy almost everyone; perhaps not that difficult for such an original thinker in such theologically superheated times. The Corpus Hermeticum , first translated by Marsilio Ficino in 1460, was thought to contain Egyptian wisdom far older than Moses, although they were actually a product of late Alexandrian gnosticism. But the powerful image of Man these arcane texts contained was revolutionary. They depicted Humanity as a microcosm which mirrored the Universe, fallen perhaps but in essence equally divine. It was a noble concept that freed the thinkers of the Renaissance from the chains of medieval scholasticism that stressed the depravity and powerlessness of human beings. This intoxicating vision of liberty led to the figure of the Renaissance magician, to Dr. Faustus as well as Shakespeares Prospero. It replaced the image of the priest as the mediator with cosmic reality. Ultimately it pointed to the idea of the scientist of today, mad or otherwise, who remakes nature in his own image through his knowledge of its secrets. For better or worse, modern society owes an incalculable debt to this vision. 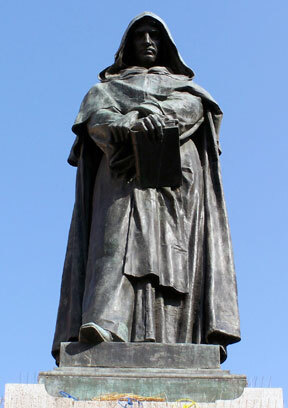 It was with Giordano Bruno, who boldly took up Hermeticism as the basis of his new Egyptian Counter-Reformation, that all these issues came to a head. Against the pedantry and bigotry, the intolerant dogmas and persecution on all sides, he set up the unifying love of the world-conquering magician. Bruno felt that his mystical experiences empowered him to cross any and all religious barriers in pursuit of his mission, and in the end, that is what caused his doom. For no good reason, perhaps merely out of homesickness and weariness of his wanderings, the Nolan (as he sometimes called himself) was persuaded at last to return to Italy. Before his arrest Bruno may have actually been preparing to try to convert the Pope to Hermeticism through magic. But there, in 1591, he was betrayed to the Venetian Inquisition and two years later returned to Rome, where he was imprisoned and interrogated for six years more before his final condemnation. His cosmological theories, hard for his contemporaries to understand, are almost incomprehensible today. They embraced ancient Hermetic wisdom as well as the most recent discoveries of science. Long before Galileo, Bruno outspokenly supported the Copernican theory of the Earths motion around the Sun. He is chiefly remembered today for his belief, so prophetically far ahead of his time, of the infinite number of living and populated worlds. And it was probably the example of his horrible fate that wisely persuaded Galileo more than anything else to recant the pernicious error of heliocentrism. Though Pope John Paul II has formally removed the taint of heresy from Galileo several years ago, there has been no indication that Bruno would ever be rehabilitated, even during the Popes so-called apology for the sins of the Church. Interestingly, the exact reasons for Brunos burning remain secret to this day.